LUXURY CONDO!!! 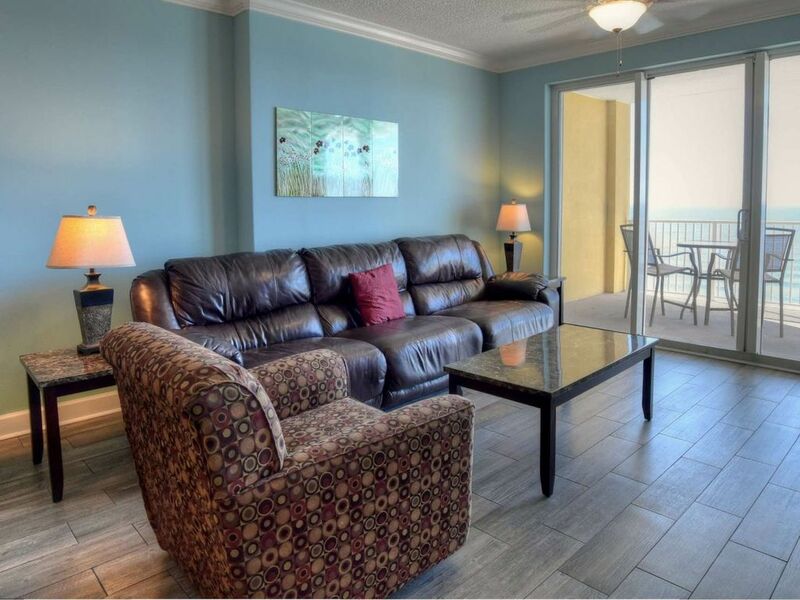 2 Bedroom/2 Bath Luxury Condo located on the West End of PCB. 1306 Tropic Winds is located on the 13th floor. This complex is only 2 miles from Pier Park. -Entrance to the balcony with seating including two chairs, side table and 2 loungers. -Dining area has a table for 6 plus 3 bar stools. Place settings available for 12. Fantastic property! We enjoyed every day. Thank you very much for renting it to us. We are so happy you enjoyed your stay with us. We hope to have you visit again soon. I really enjoyed the condo!! It was perfect. The beach was awesome and the view from the condo was magnificent! I loved the check in procedure they have in place. Only downfall would be the parking. I would just prefer to be in an open lot. Booking was easy, condo was immaculate. Condo is great. Weather has been good. Enjoying our visit! My "party of 6" booked a different condo elsewhere thru a different agency, only to be scammed of our money and left with no place to go upon arrival to PCB. We were referred to Whitney of itrip vacations, who I refer to as an angel from heaven on earth for saving our vacation. She painstakenly went out of her way to take care of us the entire week! She worked with us to find us this charming and adorable Tropic Winds condo, to fit our needs financially (after having lost so much money); and physically to comfortably accommodate all of us. We couldn't be more grateful! Thanks to Whitney, our vacation was saved. We enjoyed dinners together in this sweet condo, watched sunsets, told funny stories until we cried, and we played games that were provided there. Memories were made. We had everything we needed; no complaints, other than needing to go home too soon. Looking forward to booking with Whitney again! "Thank you" doesn't seem like enough after starting the week off with such a nightmare... much love ~. The Stranges. Major Credit Cards Accepted. Monthly rates show the rental amount of a four week trip. A 15% deposit is required upon confirmation of all reservations. A $44 limited damage waiver will be applied to all bookings in lieu of a security deposit. Local, State & Federal Taxes 13%. Processing Fee $99 per trip. Fall Into Savings Book Now and Save 20%.